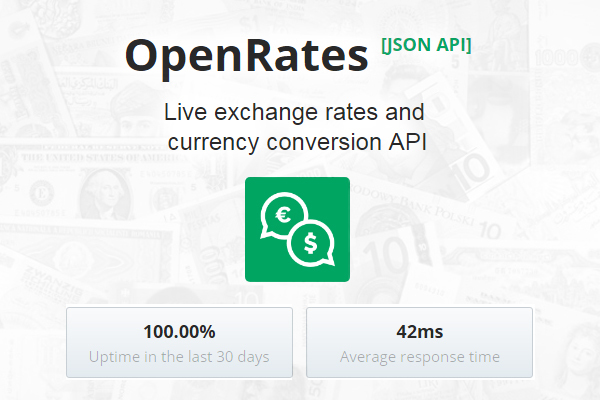 OpenRates provides accurate and current exchange rates for more than 32 types of currencies in the JSON format. This data is delivered right to the computer screen of the user with the most up-to-date values. All the exchange rate and currency data is taken from the European Central Bank and it is updated every day at 4:00pm CET. OpenRates is open to all users and its simple and lightweight API design makes it a useful tool. The portable JSON API provides not only the live foreign exchange rates but also gives historical data on previous forex rates. The API is simple and easy to integrate with any other program. The data is tracked and combined using an algorithm which is what makes OpenRates a reliable source of data. The live exchange rates are given in a completely fair and unbiased way. The OpenRates currency conversion API is in a format that everyone can use and there is no complexity in the website. The queries sent are not at all complicated and users new to API can also learn how to use them. The best part about this currency conversion API is that there are no authentication methods required and neither do the users have to sign any long-term contracts to use the services. The rates provided on the OpenRates API are available for a 19-year history. They are categorized periodically from 1st January 1999 till date and any user can access this data using the currency conversion API. This makes OpenRates a useful resource for economic or financial research and analysis. The data extracted from this resource has been used by users for all types of applications, framework and situations. Since OpenRates is so simple to use and easy to access, eCommerce websites are using it to calculate the total for international customers. The sophistication of the system allows accounting departments and finance staff can also manage the shipping and other fees. The non-complexity of the currency conversion API has made it useful for students from schools and colleges as well. The queries to use for accessing the latest rates are also very simple and available on the website. There is a separate command for the current rate and a separate one for the historic exchange data from the year 1999. You can even change the base currency which is set to Euro by default to any of the 31 other currencies of the world by appending the base parameter. There is a query to generate data for multiple specific currencies as well. OpenRates also supports cross-domain requests for JSONP and you can change the callback parameter and give the function a name of your choice. There is also an option to make HTTPS queries with OpenRates as well. The live foreign exchange rates API is very easy to use and is reliable as well. The server hardly ever goes down and almost always has a 100% uptime. The response time is also very short and it generates data within 42 ms. In short, the currency conversion API is a useful tool no matter what the application.